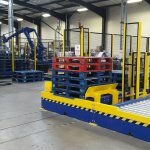 Looking for low cost solutions for handling fast moving pallet stock? Andrews Automation Ltd is able to offer a number of solutions for handling palletised stock with significant throughput. 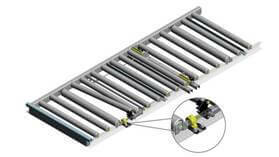 One of the more cost effective options available is to utilise the Interroll Pallet Roller Flow storage. This system is perfect for clients looking to maximise storage space and can potentially reduce the number of stock aisles required. 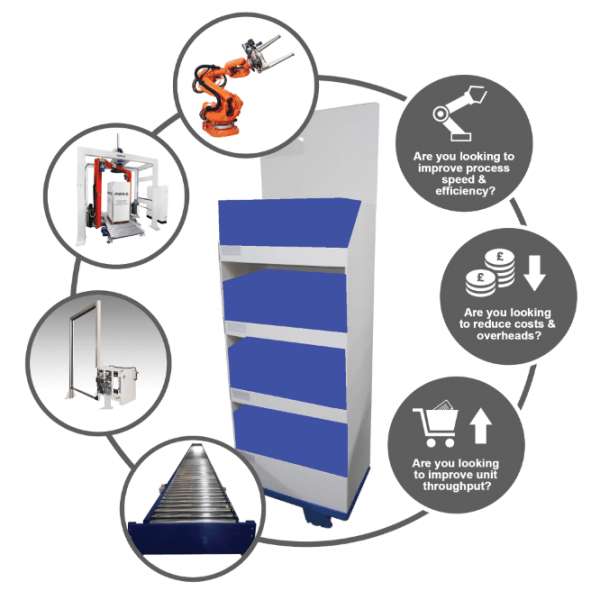 It allows stock to be rotated on a FIFO basis, reducing the requirement to waste fresh or date sensitive goods by automatically controlling goods from the loading area to the order pick face. Separate loading and picking areas both increase productivity and efficiency, as well as reduce energy consumption. It also allows warehouse vehicles to be kept at a safe distance from picking personnel. The Pallet Roller Flow system has the capability to accommodate a wide range of pallet types such as standard Euro or CHEP pallets, as well as varying weights, sizes and materials. The system also is available with the Time plus separator function. This works by, on lifting the first pallet from the picking area, a 20 second time delay begins allowing the FLT driver suitable time to remove the pallet before the separation device releases the next pallet in the queue. This pedal-free system allows drivers to remove pallets without the worry of height restrictions, which is particularly useful when working with restricted visibility e.g. at high levels. 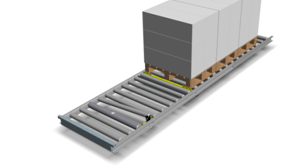 Why choose The Pallet Roller Flow system?